Atlanta and its surrounding areas cover over 8 thousand square miles, making it home to over six million Georgian locals and transplants alike. From county to town to neighborhood, each area of Atlanta communities have a distinct flair. They share a rich history rooted in centuries of civilization, leaving historic districts and treasures for generations of Georgians to enjoy. Real estate in Atlanta communities is as diverse as the towns within them. The region’s past has played a significant role in shaping the architectural landscape of the area, which is why so many homes have a Georgian-Revival, Craftsman, or Queen Anne influence. Even newer developments pay homage to the Georgia standard, while also offering modern amenities. 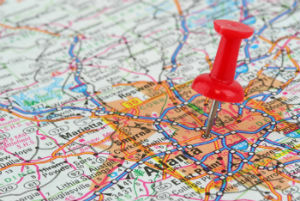 Thanks to the sheer size of the Atlanta area, the options for homeowners abound. Each county offers interstate access, various home types, and views of the state’s natural beauty. Choose your Atlanta community based on commute time, neighborhood features, or home style.